Source: The Italian Diabetes Cookbook. Recipe Credit: Amy Riolo. Photo Credit: Renee Comet. Author Amy Riolo says, "All of the bodies of water that border Italy—from the Adriatic to the Ionian, Mediterranean, and Tyrrhenian seas—contain multiple varieties of shrimp, making shrimp popular everywhere. If you’ve never prepared shrimp before, you’ll be amazed at how easy it is. In my seafood cooking classes, I often tell students that, if they’ve had bad luck making shrimp in the past, it’s because they’re doing too much, not too little. The key to preparing good shrimp is choosing the freshest shrimp possible and cooking them just until done—not a second longer. Baby, regular, and jumbo shrimp all work in this recipe, so feel free to use whatever is freshest." 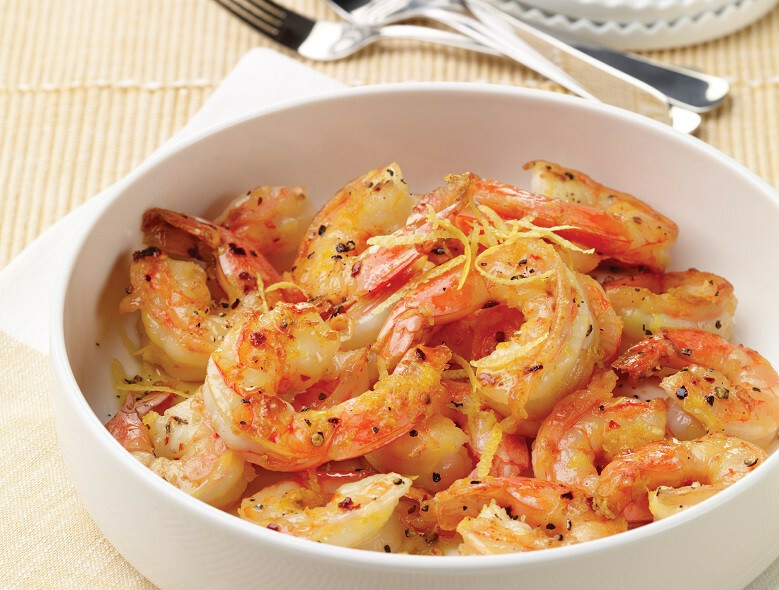 When olive oil begins to release its aroma, add shrimp, salt, black pepper, and crushed red chile flakes. Cook shrimp on one side just until the tail of the shrimp is bright pink, approximately 1–2 minutes. Turn shrimp over and squeeze lemon juice over top. Cook shrimp until all gray color is gone and they are pink and cooked through, approximately 1–2 more minutes. At this point, shrimp should be coiled slightly tighter than when they were raw. Shrimp will continue to sizzle in the pan. When they are cooked completely through, transfer shrimp to a serving platter, garnish with lemon zest, and serve immediately.